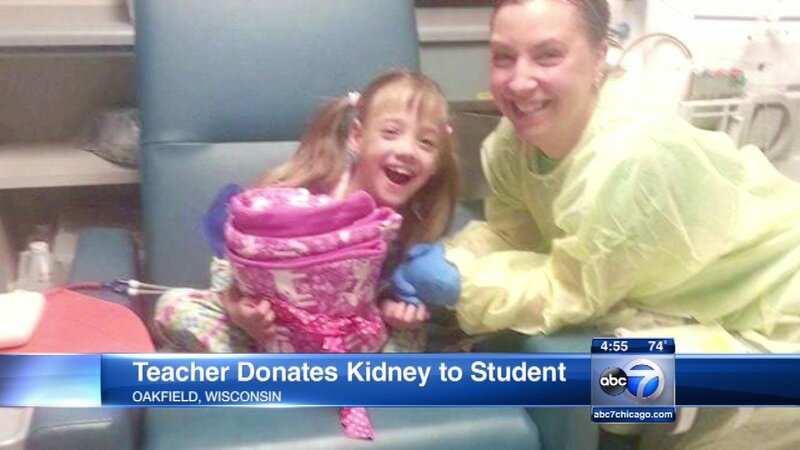 OAKFIELD, Wis. (WLS) -- The start of this new school year had a special meaning for a teacher and student in Wisconsin. Last school year, 8-year-old Natasha Fuller was suffering from chronic kidney disease and frequently missing classes because of dialysis. Mrs. Jodi Schmidt, a teacher, wanted to help. She found out she was a kidney donor match for Natasha and the two underwent a transplant surgery in May. "I really believe that it was meant to be, that it's my path," said Schmidt. Mrs. Scmidt and Natasha are both doing well and have become close friends. They were welcomed back to school during a special assembly this week.